On April 9 we kicked off the One Million Fresh Start Families by 2020 campaign with a new brand and website: Core Connectivity – A Foundation to Empower Families. 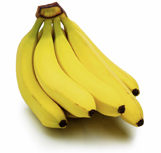 Banana Moments Foundation will continue to serve as the 501-c-3 parent corporation for this initiative. Your participation is easy and makes a difference. 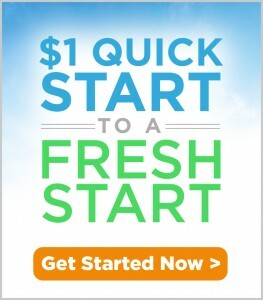 Go to $1 Quick Start to a Fresh Startand enroll in this campaign by purchasing the 10-minute video for one dollar. Whether you are just starting family life with infants and small children, or you are a seasoned parent with teenagers and young adults, or a blend of the two, it is never too early or late to get a fresh start. 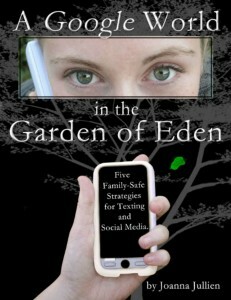 So we all know that the Internet and mobile phones are a game changer for parenting and family life. And sometimes we just need to hit the “reset button” in order to clear out all of the corrupting messages of the untruth in the network culture, and transform our family life into a liberating experience. There is an opportunity to form deep, rich parent-child bonds in this environment that conditions youth for authority as a relational experience, rather than a matter of structure or position. A home is much more than bricks and mortar. It is the domain of hearts and minds. And building a home for hearts and minds involves culture – the software of the brain. It establishes beliefs and values that shape the quality of our thinking and drive behavior. As household executives, parents are the “programmers” for family life that influence and shape the character development of children. By the same token, we live in a global, consumer-oriented, network culture that to a large extent floods our households with beliefs and values that focus on things that don’t really matter, are not true and stir anxiety. Family members are equipped with wireless mobile devices and there is a constant bullying message via multiple media streams that says you are not enough. When is the right age to get my child a mobile phone? And then what? Professionals working with children who suffer from anxiety, depression and addiction, often encounter challenges when parents are uncertain or lack confidence about their leadership role at home to promote healing. What if there was a resource to help you engage the parent as a part of the healing? 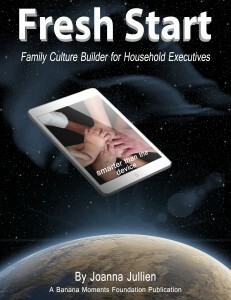 Fresh Start is a crash course for parenting in the social network. As a self help book, parents learn to build a family culture with hands on lessons and exercises, to build trust, establish open communication, and foster individual resilience. “Family lifestyles are hectic and distracted. Home is often perceived by youth as not a safe place. 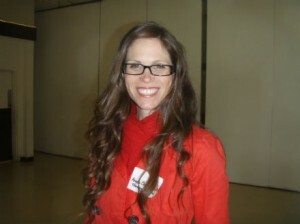 We work with Joanna Jullien because her parenting philosophy and teaching to help parents relate to their tech-savvy children is an essential aspect of restoring health and peace of mind for children who need to bond with parents in authentic ways.” — Angela Chanter, PsyD., Therapeutic Solutions 360 in Roseville, Ca. Mary Lisa Patton, B.A.Psych, CADCII, IS, NCFAC. “As a professional, Fresh Start … opened up my world to new issues my clients and their families may experiencing in their search for connection and healing…The family motto and value section is an invaluable tool. 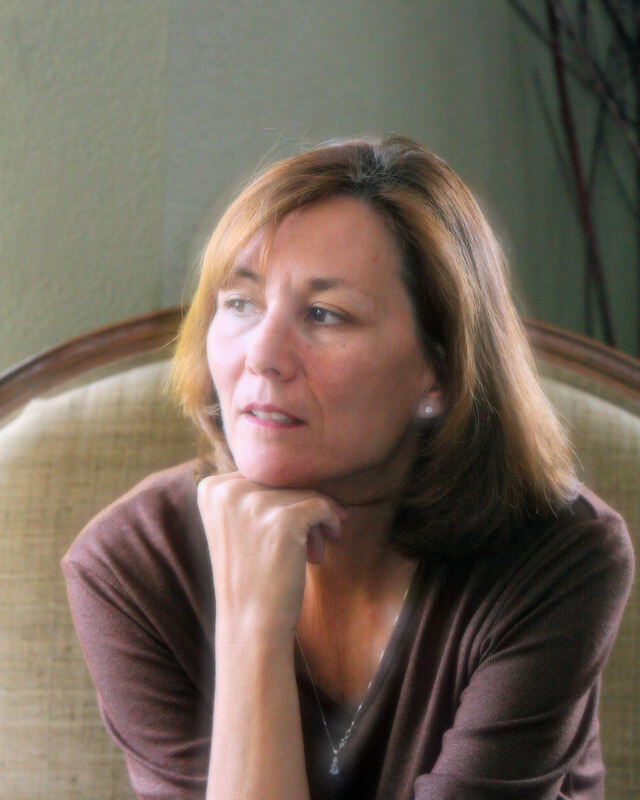 When a family comes together with a purpose or creates a new purpose that was non-existent before, it strengthens the family system.” — Mary Lisa Patton, B.A.Psych, CADCII, IS, NCFAC, founder of Beloved Recovery. “The family is an important structure; in order to function well it requires more organized thought and mindful communication than going through the motions. It is a lot easier said than done in our society today.” Christi Benz, mother of four in Granite Bay, Ca. “Fresh Start is profound in its simplicity… I encourage you to buy this book and dig into its principles. Don’t let our cyber-culture take time and relationship away from your family.” — Kim Fredrickson, M.S., MFT in Roseville, Ca., and author of Give Yourself a Break: Turning Your Inner Critic into a Compassionate Friend. 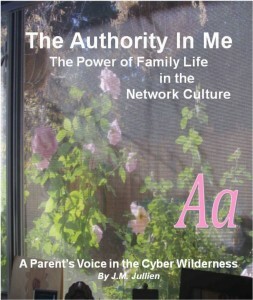 Joanna offers private family culture consulting to help parents strengthen the parent-child bonds around the value of personal safety in a cyber-powered world and the character of a liberated individual. (For more information about the consulting packages contact Joanna: Jullien@surewest.net). 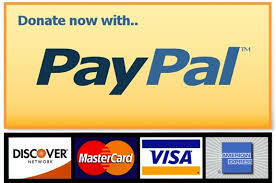 Standard rate is $50 per attendee, not including cost of facility, travel and materials. To receive free monthly and quarterly updates on what is trending with popular culture, technology and the impact on families, register your email here to receive Banana Moments: Family Business Quarterly and monthly updates. (Your contact information is private and will not be sold or traded). Parenting is a divine appointment, and freedom from manipulation of the social network comes from our God-given ability to think for ourselves. That authority cannot be taken away.